Digital panels over a speaker grille background. tap actions to change colour located on phone battery level indicator. 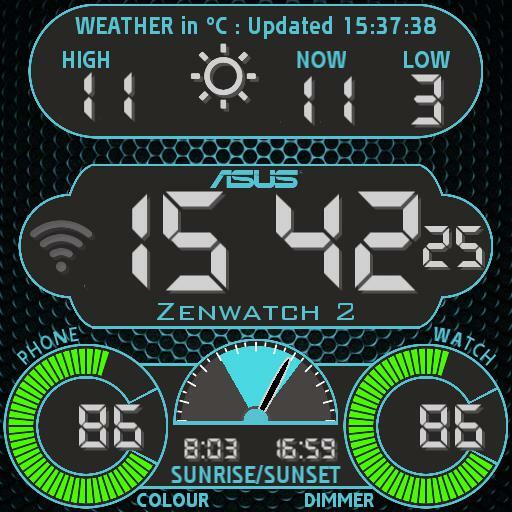 you can activate an incremented by 10% dimmer by tapping on watch battery level indicator, and update weather on left end of the weather indicator. tap centre of time bar to show date bar overlay, which fades away after three seconds. tap sun phase indicator to show moonphase indicator, which fades away after three seconds also. twin displays for battery levels and charging indicator icons. day, date with date extender, month, 24hr time, blinking time separator which shows seconds. shadows on all variable assets. colour change script is in the main script area. feel free to change hex codes to change colour presets.